The recent Diamond Lake Blooming Alleys for Clean Water project built on the previous partnership of Metro Blooms and the Friends of Diamond Lake and successes in the Go Blue! Community Makeover project. 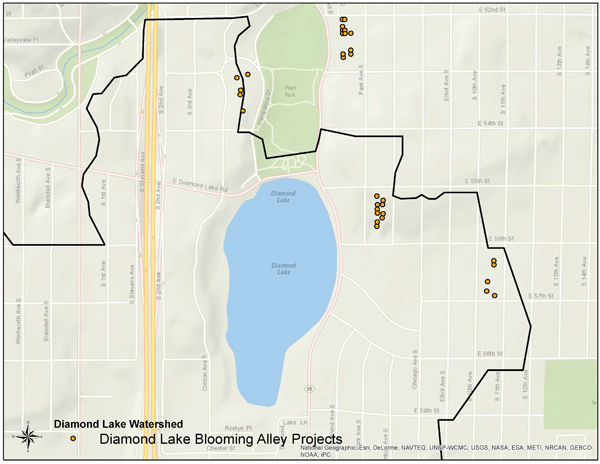 Over the past two years, Diamond Lake Blooming Alleys for Clean Water engaged residents on targeted blocks in the Diamond Lake watershed to install new stormwater Best Management Practices (BMPs) on their properties. Installations were placed to create the biggest impact in improving both water quality and neighborhood aesthetics. 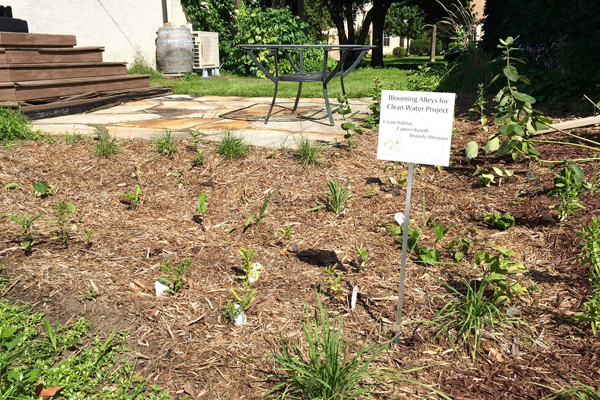 In several cases, neighbors partnered across properties to capture stormwater runoff. As you walk through the participating alleys you will see some of the new raingardens, permeable pavement and native plantings installed as part of this program. 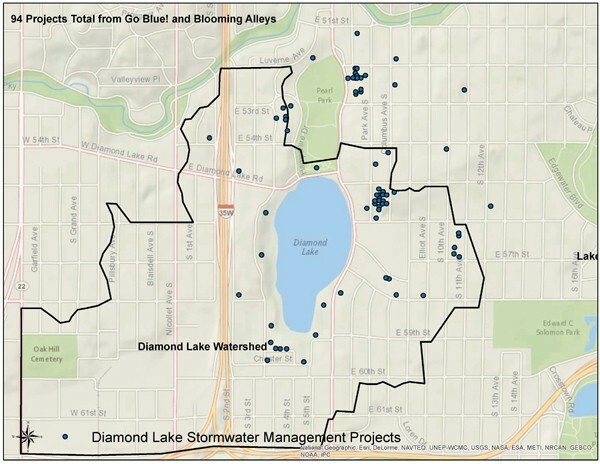 We celebrate the 29 homeowners on four blocks in the Diamond Lake watershed who installed 51 new features through Diamond Lake Blooming Alleys for Clean Water. This includes 17 permeable pavement systems, 15 raingardens, 6 planted swales and 13 native plantings. We also celebrate all who made this possible by creating the plans, assisting with plantings, and providing all of the other expertise and effort that went into these BMPs. That’s a lot of community action! These features help to infiltrate and clean stormwater runoff before it enters Diamond Lake and Minnehaha Creek. Runoff from alleyways is often the most polluted stormwater to flow into lakes and streams because it picks up oil, fertilizer, salt, pet waste and debris as it flows off garages, over driveways and down the alley to the storm sewer. 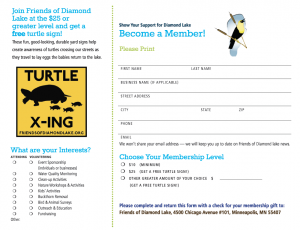 These new features will keep one pound of phosphorus and 264 pounds of sediment from washing into Diamond Lake each year. On average, they will also reduce the volume of stormwater runoff flowing into the lake by 408,076 gallons yearly! These beautified alleys not only help improve water quality, they also create inviting community spaces. The new native plants also provide valuable habitat for native bees and butterflies throughout the neighborhood. 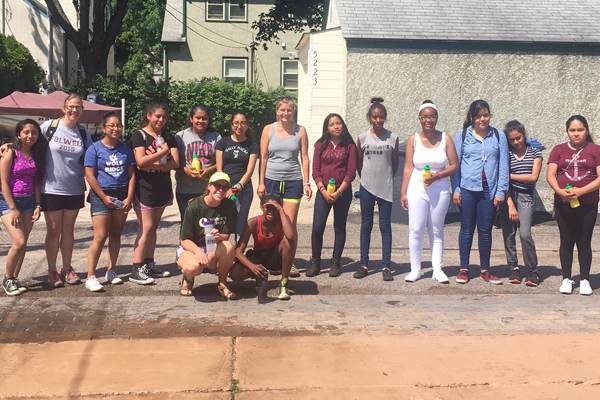 These installations were made possible through partnerships between neighborhood residents, Folwell Middle School students, Friends of Diamond Lake, Metro Blooms, Minnehaha Creek Watershed District, Hennepin County, and Freshwater Society Master Water Stewards. If you would like more information about how to implement these practices in your own yard, visit the resources section of the FoDL website. Thanks to Laura Scholl, Environmental Project Director, Metro Blooms, for providing information for this article. This entry was posted in News by Shelley Johnson. Bookmark the permalink.